"Why does it matter whether I am a boy or a girl? But it does. It really, really matters." When Alex was born, the doctors described him as "sexually ambiguous", with both male and female reproductive organs. For the last fourteen years his parents have raised Alex as a boy. They dressed him in boys' clothes, sent him to a boys' school and gave him medication to help regulate his hormones. But last night at dinner, Alex made an announcement, three words that would change everything: "I'm a girl". 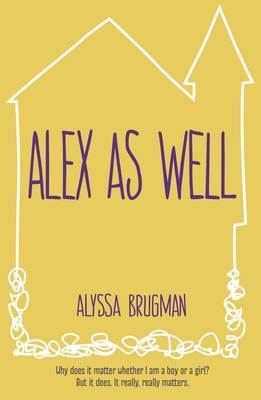 And when Alex sets about changing her life - her wardrobe, her school, her entire identity - no one knows how to react, least of all her parents. A story of bravery and independence, Alex As Well follows 15 year old Alex Stringfellow, a intersexual person who was raised as a boy and decides that she prefers being a girl. I haven't read anything like this before, and it really opened my eyes. It deals with themes of gender confusion and struggles with intersex identity in a moving, empathic way.